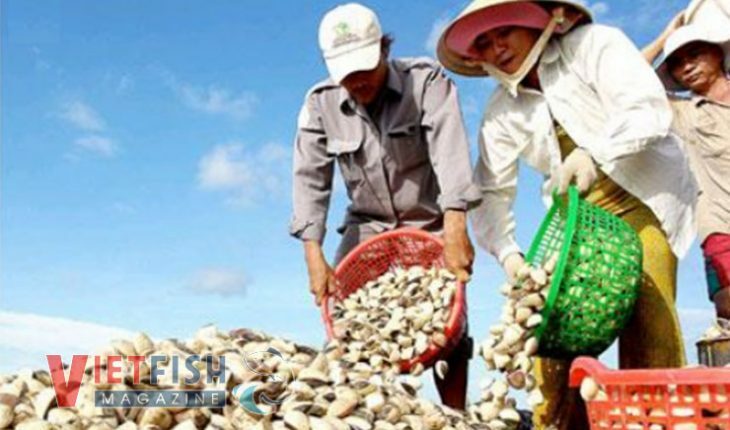 Nguyễn Văn Quí, Head of Agriculture and Rural Development Office in Gò Công Đông district said that local farmers stocked clams in 2,200ha in 2019, mainly in coastal areas of Tân Thành commune and northern rivulet mouth of Cửa Tiểu, increasing by 200ha as compared to the previous year. Clams are weighing up stably with only 30ha of clams being found dead (20-30%), down by 50% as compared to the previous year. According to many households, clams die en mass in dry season. Local authorities and competent agencies are identifying the cause of death to warn farmers so that they will impose measure or re-stock to fill the ponds. Clam farming has been growing in Gò Công beach for years, providing job and income for local farmers, assuring social security, and creating products for consumption and export. There are only Tân Thành and Gò Công Đông communesin Tiền Giang participating into clam farming. Farmers take use of alluvial grounds to rear juvenile clam till harvest season. Gò Công of Tiền Giang reaches 20,000 tons of clam every year with capacity 10 tons/ha. It was over 5,500 tons in Q1 alone and price ranged between 19,000 and 21,000 dong/kg, slightly increase year on year.